Jane struggles against her job's time clock. Hunting for inner peace, away from modern machinery, and outer interaction with humanity, a journey within the workplace. After the closing credits, viewers will pine for vacation days, away from cel phones, copy machines, and computers. 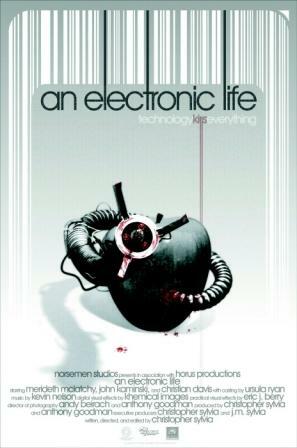 Director Christopher Sylvia reminds us we need only to conquer technology to live life to its fullest. 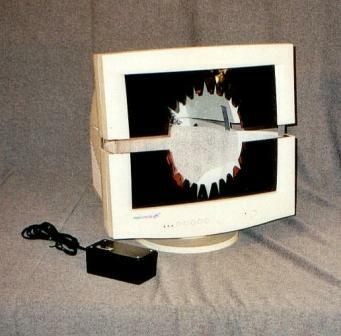 This bizarre looking computer monitor is motorized and designed to "chomp" a man's head in the film. This claw was mounted on the end of a cybernetic tentacle. The claws were animated with opening jaws. 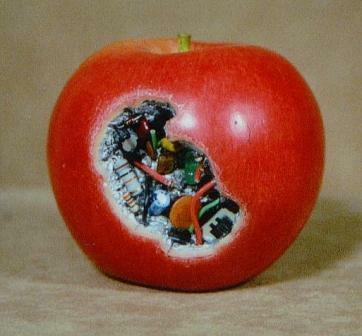 Almost as bad as finding a worm in you apple, is finding electronics in it! 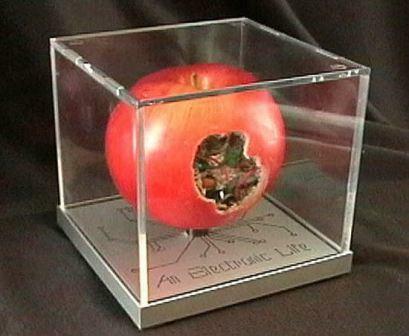 We produced a limited edition of 4 replicas of the cyber apple to sell in a custom display case. They have all been sold.